This multitool's the handiest of 'em all: light and compact, packing maximum tools (20!) in minimal space. Multitools are the handiest things around—if they're around. Heavy ones are going to be left behind. That's why this one is the handiest of them all: it's light and compact, packing maximum tools (20!) in minimal space. An internal storage compartment holds Phillips and flat drive heads. Handy types will love getting to be heroes, anywhere, anytime. Sporty types—bikers, snowboarders, skateboarders—will love being able to fix their gear on the fly. (Speaking of flying, it's TSA-compliant.) Made of a strong, engineered polymer composite that's 40% lighter than titanium, it has a tough, stainless steel core. 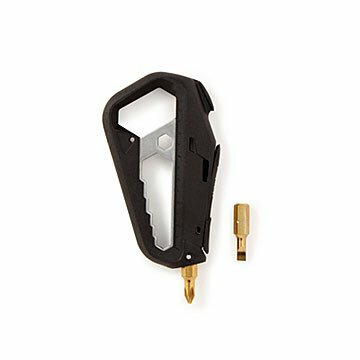 And unlike metal multitools, its secret purpose in life isn't scratching up your electronics. Designed in Australia. Made in China. Wipe down with a damp cloth and dry.